Northern Group Locksmith is the most reputed emergency locksmith company in the GTA. Eager to provide top class security solutions, we’ve assembled an all-star team of certified technicians that are on call 24/7. We are fully committed to fast arrival time. This means you can always depend on us to be there for you. Our hard work and lightning fast arrival time have gained us a highly positive reputation among the local residents of the GTA. Northern Group Locksmith vans come well-equipped with the latest advancements in the lock & key technology, so we can easily handle any type of emergency locksmith situation. We can safely pry open any stubborn door lock or trunk. We stand by our strict safety policy, and our patented operating techniques. Our friendly customer care representatives will give you the five-star treatment you deserve. As soon as you leave your contact information with our team member, the nearest available technician will be by your side. We’ll be able to give you a great quote beforehand over the phone, so you can rest assured that we do not charge any hidden fees. Why Choose Northern Group Locksmith? 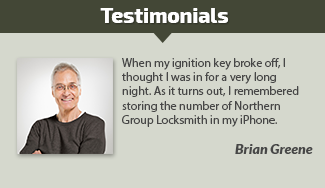 At Northern Group Locksmith, we go out of our way to ensure your safety at home and on the road. It doesn’t matter what type of locked out emergency situation you’re in, we’ve got the solutions to help. We offer the most competitive prices in the GTA for commercial, residential and automotive locksmith services. Don’t settle for second best during an emergency situation (especially when it come to home security issues). Give us a call today, and let us come quickly to your rescue!